I don’t know about you but I BLOODY LOVE breakfast. It’s my favourite meal of the day, maybe because I always start the day with a workout so by the time I’ve finished, I’m STARVING. 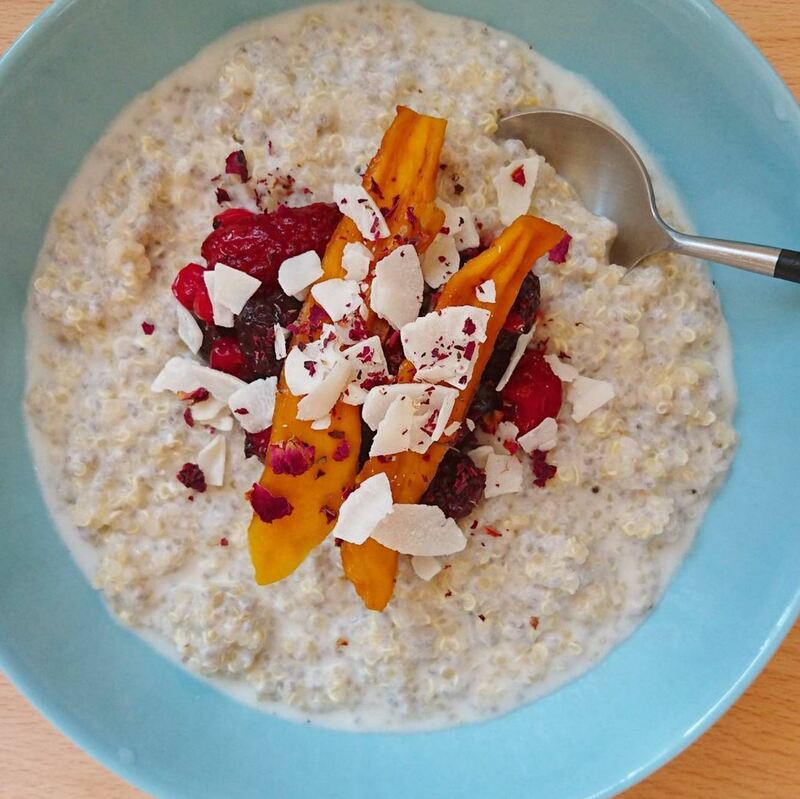 A fantastic way to get you ready for the day and an opportunity to cram in a load of nutrients and goodness to kickstart your brain and body, I thought I’d pull together 12 of my favourite breakfast snaps from my Instagram account which many of you have liked. Some are vegan friendly and dairy-free, some you can make the night before, but all are healthy, super easy to make and serve one person. Here goes! Stir well and keep in the fridge overnight. 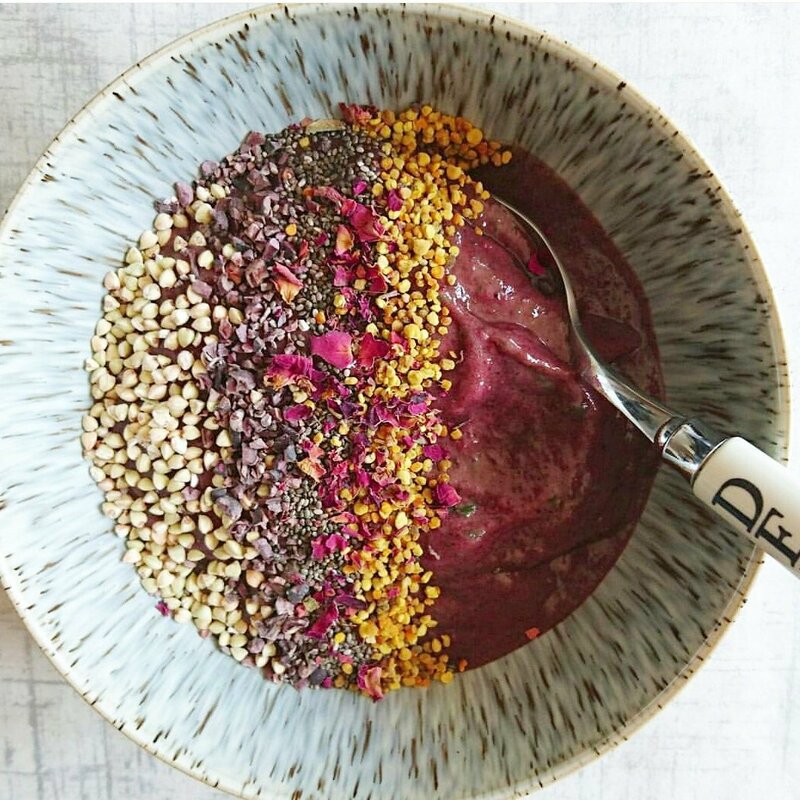 In the morning add your toppings – I went for strawberries, drizzled with my favourite Sweet Freedom Choc Shot and sprinkled with bee pollen. 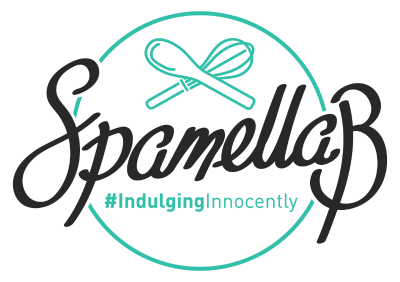 Cook the oats in the water and coconut milk for a few minutes, then stir in the grated courgette and vanilla and continue cooking and stirring for 8 minutes. Remove from the heat, add the mashed banana and raspberries. 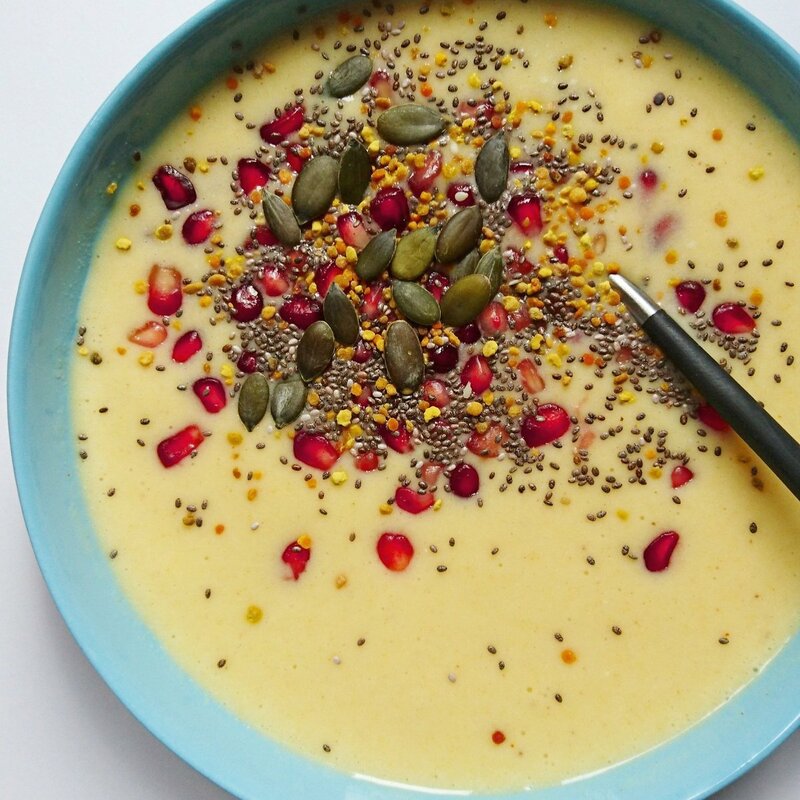 Pour into a bowl and top with pumpkin seeds, bee pollen and some dried rose petals. Leave in the fridge overnight. In the morning top with some berries, coconut chips, dried mango and dried rose petals. In the morning top with dried mango (unsweetened), bee pollen and some coconut chips. Cook on a medium heat in a small pan for 5 minutes, then remove from the heat and stir in the poppy seeds. 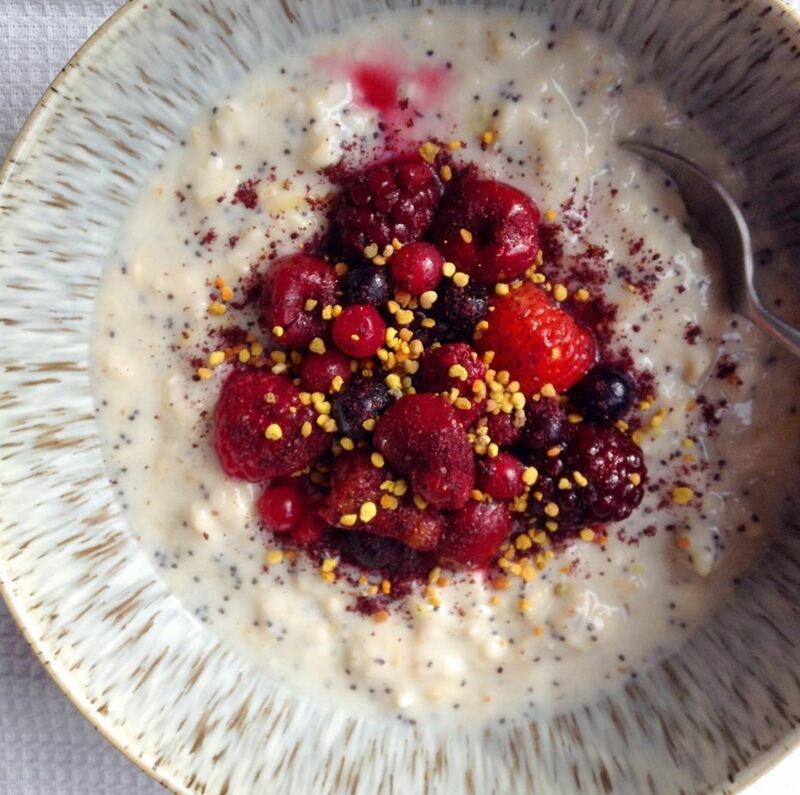 Top with berries, Arctic Berries freeze-dried blueberry powder and bee pollen. Whizz up the first six ingredients in a blender (I use my Nutri Ninja), then stir in the chia seeds. 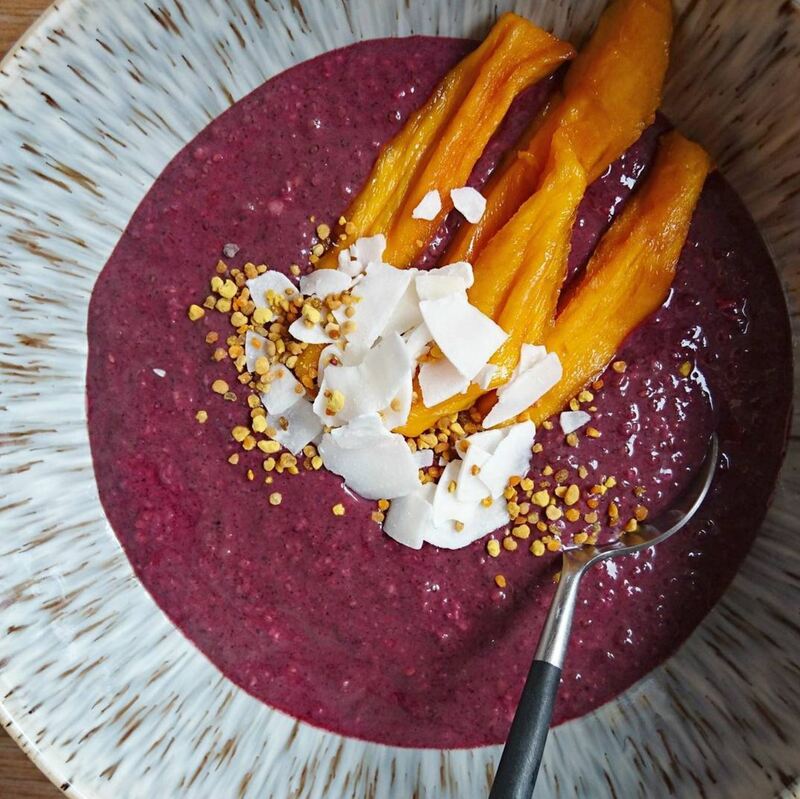 The next morning, tip into a bowl and top with a mini sliced peach, buckwheat groats, bee pollen, Arctic Berries cranberry powder and Punch Foods Coconut Brownie superseeds. 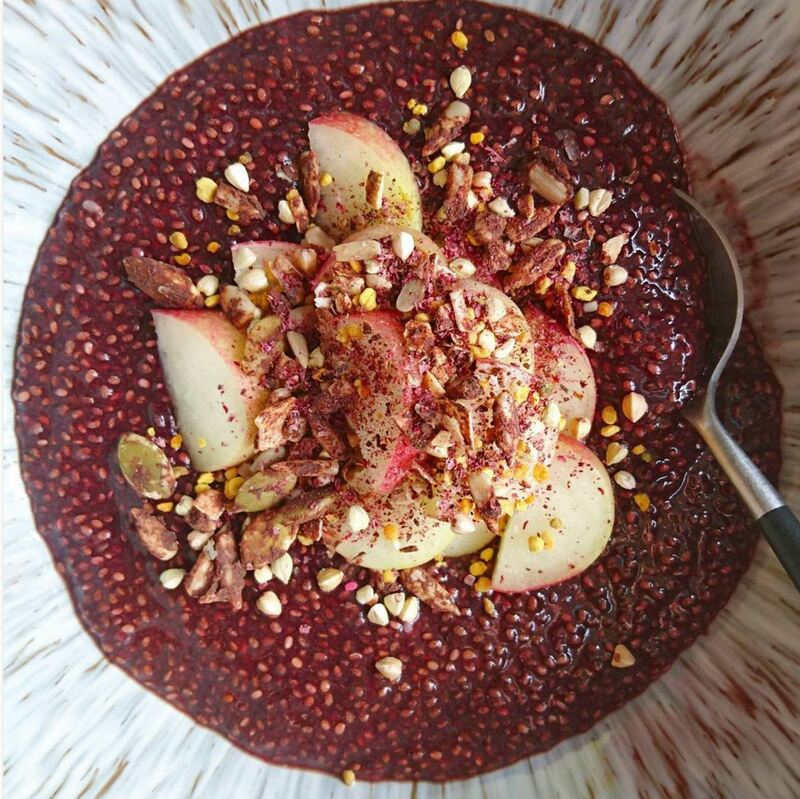 Simply whizz up in a blender (I use my Nutri Ninja) until thick and smooth, then pour into a bowl. Now go crazy with toppings! 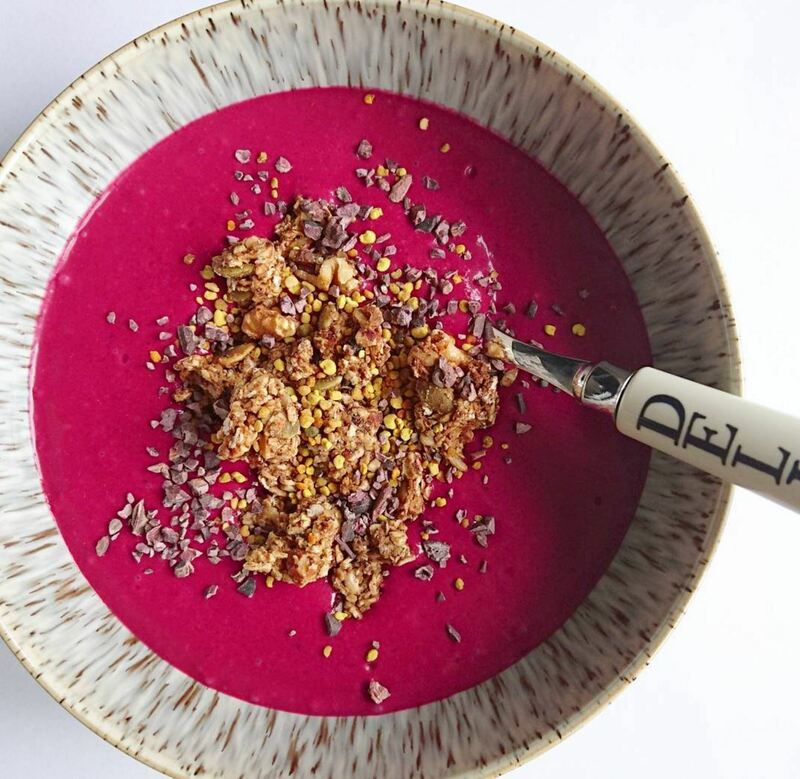 I sprinkled over Kaizen Living chia seeds and cacao nib, bee pollen, buckwheat groats and dried rose petals to make it look extra pretty, of course! I blended this in my Nutri Ninja blender until thick and smooth, then poured into a bowl and topped with blueberries, pomegranate seeds and my favourite Rolla Granola Hot Raspberry granola – perfection! This morning I topped with Punch Foods Cinnamon Spice superseeds, flaked almonds for the good fats and a few extra dates. 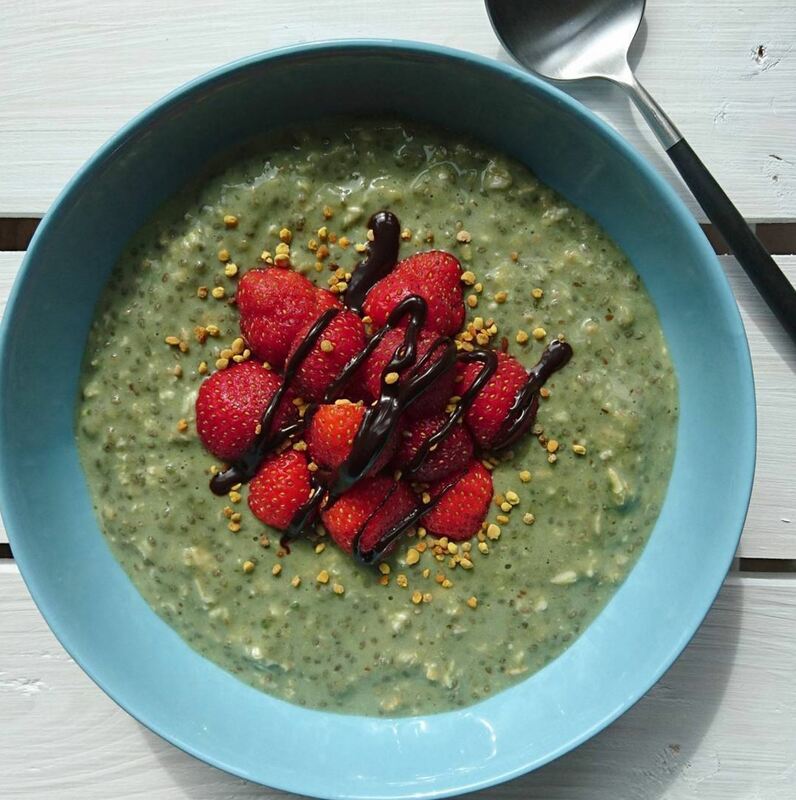 Blend all ingredients except the chia seeds in a Nutri Ninja blender until thick and smooth. Add 2 tablespoons of water then blend again. Now mix in the chia seeds, stir well, then pour out into a kilner jar or container. Chill in the fridge for at least 30 minutes, or overnight. Whisk together the ingredients to make sure there are no lumps. 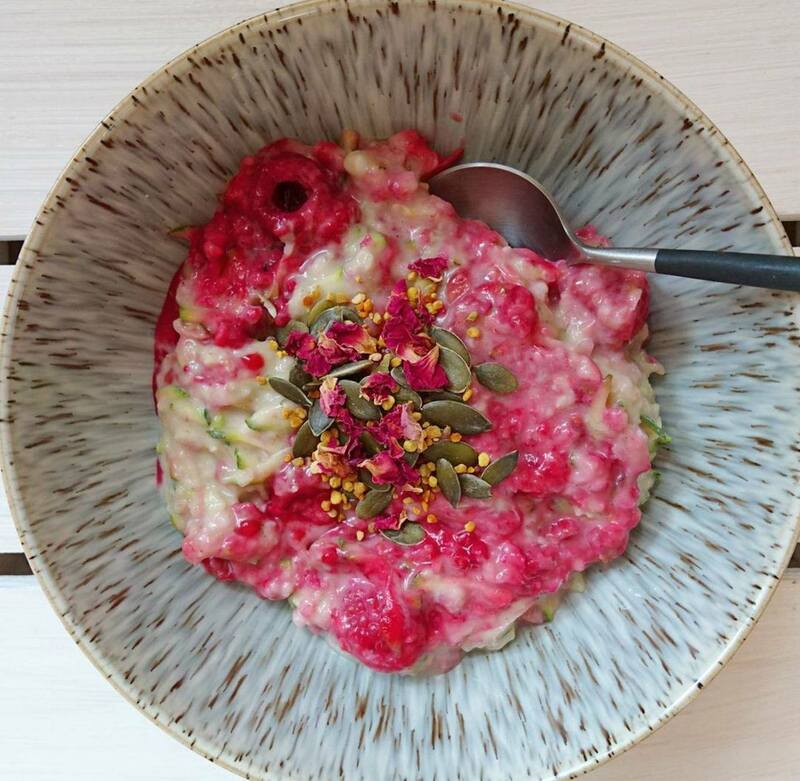 Pour over the chia pudding and either eat straight away or return to the fridge. 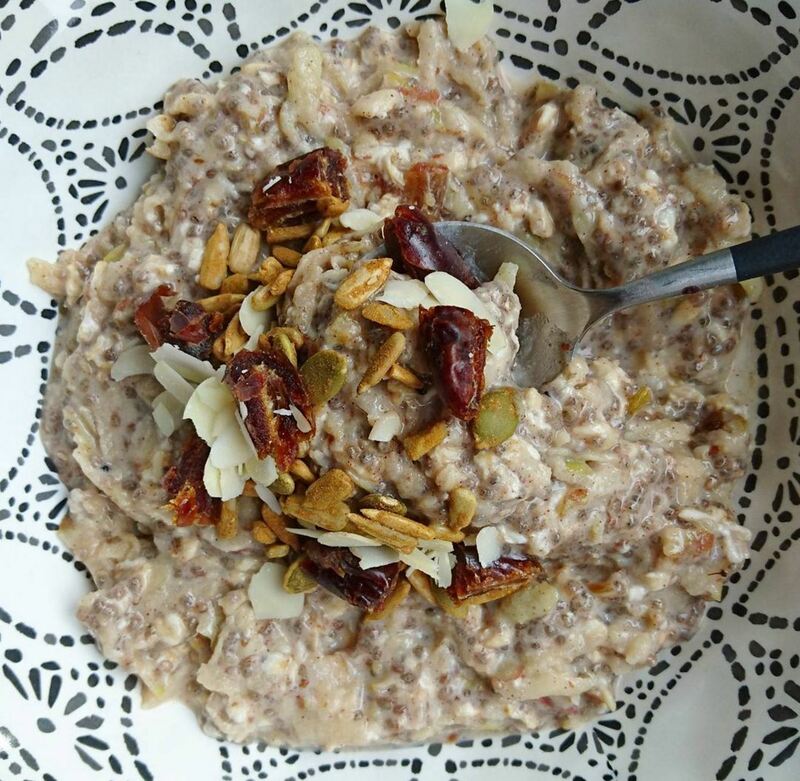 Sprinkle over cacao nibs, buckwheat groats and flaked almonds (or whatever you want) and dig in! 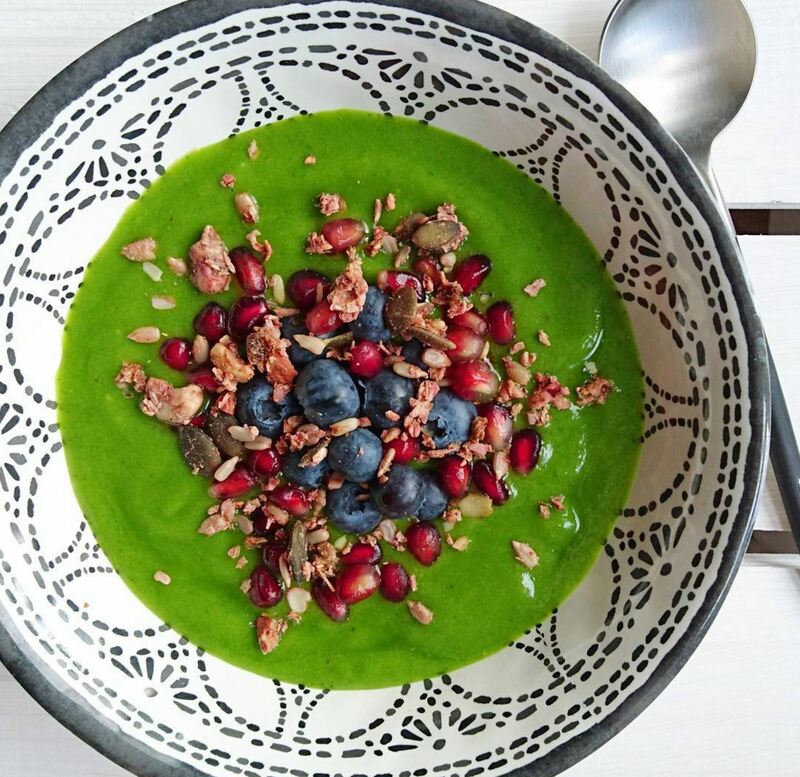 Blend in a Nutri Ninja and top with pomegranate seeds, pumpkin seeds, bee pollen and Kaizen Living chia seeds. 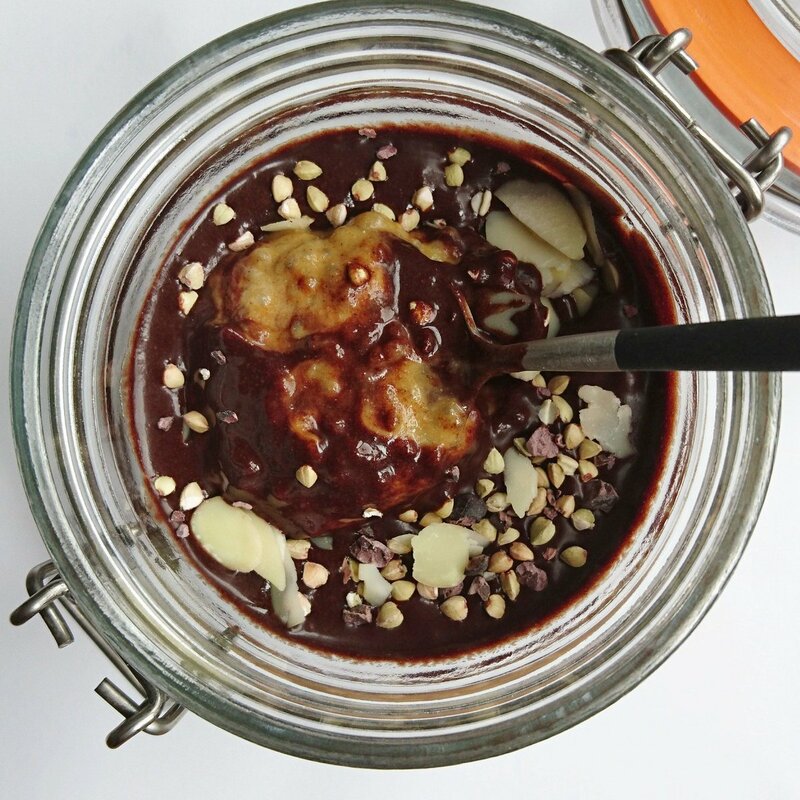 Whizz up in a Nutri Ninja until thick and smooth. Pour into a bowl straight away. Top with RollaGranola, Kaizen Living cacao nibs and bee pollen.